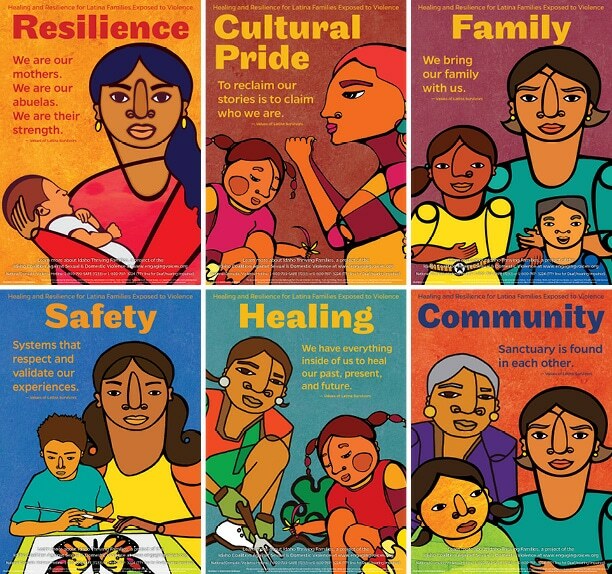 Select poster order type: Choose an option"Order series with Idaho Coalition contact info (quickest delivery)""Custom order series to include your organization's information (1-2 week wait)""Download PDF editable version (immediate download)"
The Latinx Thriving Families campaign poster series demonstrates six themes and values that were identified by Latinx survivors from across the state that feature resilience, family, healing, community, cultural pride, and safety. 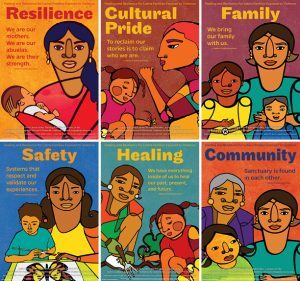 The poster illustrations have been created with an eye towards honoring Latinx culture and heritage and features captivating imagery cultivated by nationally acclaimed artist and activist Favianna Rodriguez, whose name you might recognize as Ben & Jerry’s new ‘Pecan Resist’ ice cream flavor, featuring Rodriguez’s artwork. Order posters series online shown in above preview (quickest delivery) or select custom order to include your organization’s information to the posters (1-2 week wait) or download, print and distribute in your community today (immediate download sent by email).